When making hair accessories sometimes choosing which alligator clips (allagator clips) to use is sometimes the hardest part. An alligator clip for hair is primarily used to hold hair back off the face. In the early part of the century they were used by stylists to hold curls in place until set. Pin Curls Tutorial can be seen here for alligator clip hair styles and a way to use alligator hair clips. 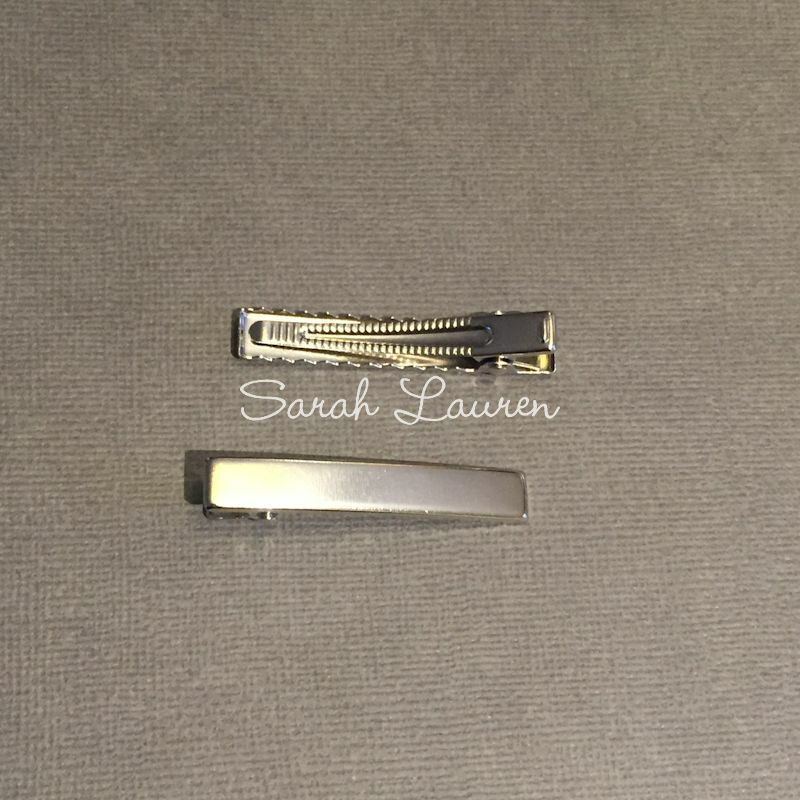 This hair alligator clip is a pinch style clip that uses a spring that allows the clips to grip the hair to stop it slipping out easily. Hair accessory makers use various clips depending on the style of bow or accessory they are making and who it is for. 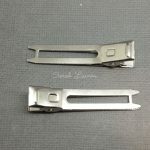 There are several types of Alligator Clips also known as Pin Curl Clips on the market. At Sarah Lauren we stock a few different styles for our customers. Single Prong Alligator clips are used to hold smaller bows and tend not to hold a lot of hair. They are perfectly suited for small children to hold back wisps of hair or to conceal a small elastic band holding the hair in place. 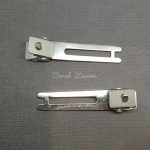 Single prong clips are available in 45mm and 35mm mini alligator clips. 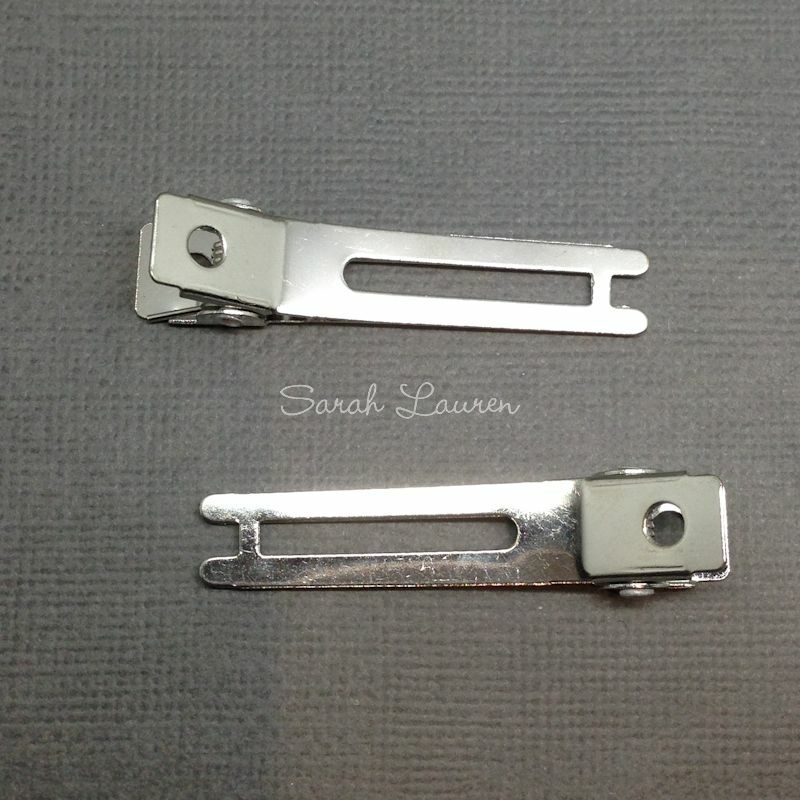 Double prong alligator clips tend to be used for larger bows and hold more hair. Double prong clips work well as the bottom prongs are separated so one prong can be pushed between hair elastics on a pony tail to keep the bow in place. 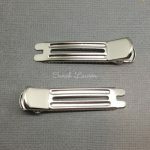 48mm double prong clips for hair bows are available. As the name sugguests 7 Coil Double Prong Alligator Clips have 7 coils in the spring that keeps the alligator clips for hair closed. Their use is the same as a regular double prong alligator clip but can hold more hair and larger bows. These are the heaviest of the alligator clips we stock. 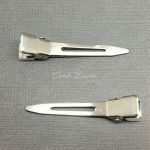 Double prong alligator clips with teeth are preferred by some customers as they feel the teeth on the clips give it added grip in the hair. This style of clip is availavle in 47mm and 35mm. This is a style of flat alligator hair clip that some bowmakers like as the flat top is easy to line with ribbon. These clips for bows are preferred by some as the teeth give a good grip in the hair. We now stock these in 35mm alligator clips for hair bows, 45mm, 60mm and the larger 80mm hair clips with teeth for JoJo Bows (also called extra large twisted boutique bows). Generally crocodile hair clips are lined with grosgrain ribbon and a non slip grip such as Triple Flip Grips. For very little ones often velvet is used to line the clip with the velvet acting as a non slip grip. Browse our website to view all hair bow hardware. This entry was posted in General and tagged 35mm alligator clips, 45mm alligator clips, 47mm alligator clips, 48mm alligator clips, alligator clips, alligator clips with teeth, double prong alligator clips, flat top alligator clips, lined alligator clips, mini alligator clips, silicone grip strips, single prong alligator clips, triple flip grip. Craft activities for children can give YOUR child the head start they need at school!